Seven years ago, the former U.S. VP was mostly a bearer of bad news. Today, he’s buoyed by talk of solutions and action. 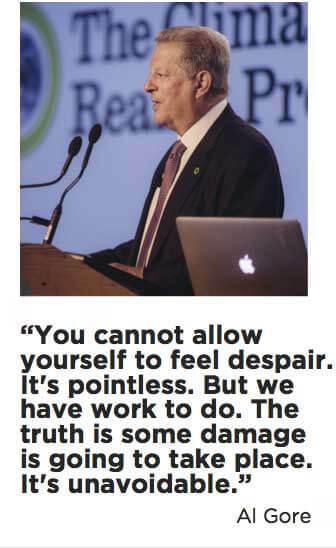 There was something substantially different about Al Gore’s two-hour presentation Thursday in Mississauga, Ontario, where more than 500 people gathered to become certified climate presenters as part of the Nobel laureate’s Climate Reality Project. The number of people in attendance has grown substantially since 2008, which was the last time the former U.S. vice-president conducted his training session in Canada. But what stood out most – at least to those who remember the 2008 sessions – is that the content of Gore’s latest presentation is more hopeful in tone and direction. Seven years ago, they say, more than 95 per cent focused on the climate problem – rising temperatures and ocean levels, melting glaciers, the increased frequency and intensity of droughts, heat waves, flooding, forest fires; and how all of this threatened public health, food and water supply, and as a result global stability. It’s not that Gore doesn’t talk about the bad stuff. That still represents about half of the presentation, and it’s far from uplifting and energizing. 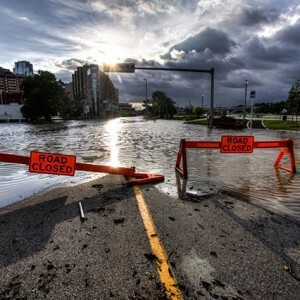 As he details the latest science explaining what’s happening to our planet, Gore’s famous slideshow reminds us of the devastation caused by Superstorm Sandy in the U.S. northeast, the 2013 floods in Toronto, Calgary and Houston. We see the droughts that are killing crops and people from California to Pakistan, not to mention melting roads in India. He shares jaw-dropping images of forest fires in B.C., Saskatchewan and Russia. A 36-degree C day in Alaska in June? An 18-degree C day in Antarctica in March? These are crazy, unprecedented numbers, he says. Gore gives us a high-level overview of what’s going on. “Warmer air can hold more water vapour,” he says, explaining that each degree F of increase expands how much water the air can hold by 7 per cent. 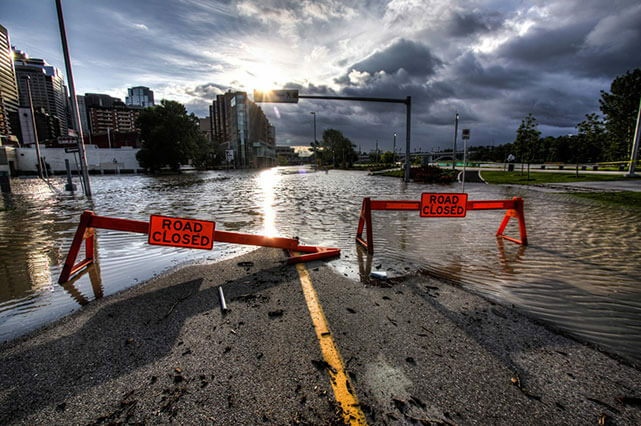 The air is soaking up more water from lakes and oceans, but also from soil. When that rain (or snow) falls, it falls faster and harder than before. “When downpours occur, they’re bigger on average now,” he adds. At the same time, when that moisture is pulled from soil and dumped somewhere else, it creates the conditions in some places for persistent drought and longer wildfire seasons. “In Canada the average amount (of forest) burned has doubled since the 1970s. We attribute this, and I’ll be quite clear, to human-caused climate change,” Gore says. How this all impacts global security is perhaps the most disturbing. Some diseases spread. Food supply is disrupted and prices spike when drought and floods destroy crops and livestock, while water scarcity results when supplies dry up or get contaminated by flooding. Uprisings and conflict in India, Tunisia and Syria, among other countries, have all to some extent been preceded by food riots or water disputes. As if that’s not enough to sour the milk in your morning corn flakes, Gore reminds us of some of the feedback loops that pose serious threats. For example, methane gas leaking from melting permafrost in Arctic tundra, an extensively studied area where “measurements are not comforting,” he says, rolling a video of scientists on a frozen Siberian lake poking a hole in the ice and lighting the emerging methane gas on fire. A torch-like flame shoots out of the hole and the scientists jump back in alarm. Remember those mysteriously massive craters discovered last year in northern Russia? Turns out they were created by underground explosions, now believed to be the buildup of methane gas caused by warming of the permafrost, Gore explains. Forest fires happening elsewhere aren’t helping. They’re dropping soot on snow and ice, creating a dark surface and stimulating the growth of dark algae that absorb more energy (heat) from the sun. This only accelerates melting. So, you might ask yourself: Where’s the hope? From there, he starts to lift the audience, like a disc jockey playing the crowd. This is where Al Gore 2015 stands apart from Al Gore 2008. Pope Francis, he says, is “doing something incredible” by raising awareness and pushing for serious action. China, worried about political unrest because of air pollution that is reducing average life expectancy, is putting a price on carbon, tightening restrictions on coal power, and investing heavily in clean energy. Professional groups – from doctors to firefighters – are speaking out and demanding strong action. Investors, and financial authorities like the Bank of England, are waking up to the financial risks of a carbon bubble destined to burst, leading to billions of dollars of fossil-fuel assets becoming stranded. More university endowments, churches, municipalities and pension funds are divesting from fossil fuels. The market for green bonds is taking off, resulting in tens of billions of dollars flowing to climate-friendly infrastructure and energy projects. Investment in energy efficiency and smart grid modernization is way up. Cities large and small around the world are committing to becoming 100 per cent renewable within the next decade. Gore then shows a compelling slide of coal plants in the United States that have been retired or are planned for retirement, as well as new coal plants that have been proposed but have since been cancelled. Expressed as dots on a map, there are too many of them to count. 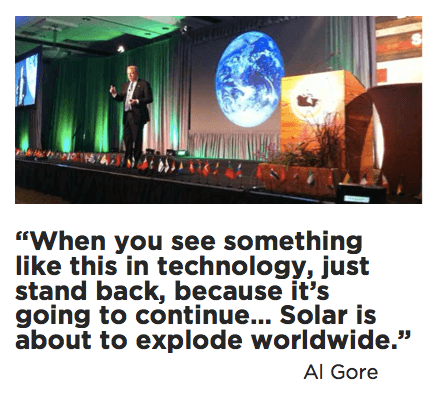 On the topic of renewable energy, and particularly the falling cost of solar, Gore gets visibly excited. He tells us that the amount of wind power generation is 12 times larger than what experts predicted back in 2000. Solar is 62 times larger. The reason, of course, is how quickly solar costs have fallen. In many parts of the world, solar power has achieved grid parity – meaning it’s no more expensive than purchasing power off the grid. A research report from Deutsche Bank earlier this year concluded that 47 out of 50 U.S. states will cross the grid-parity barrier by 2016. 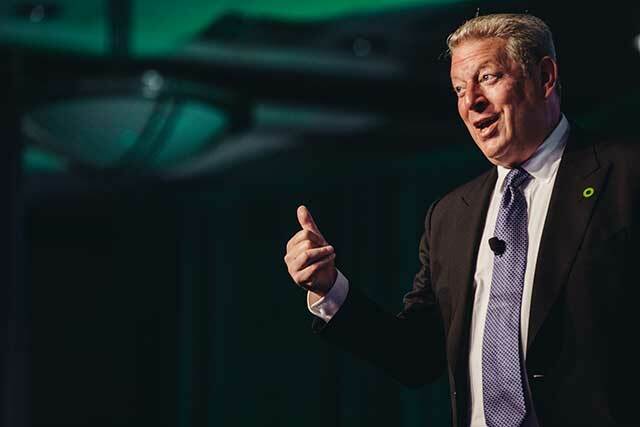 To explain why we’re at an inflection point for solar and other renewables, Gore uses the analogy of how an ice cube becomes water when the temperature shifts from zero to just 1 degree C. Prior to grid parity, the solar market was the ice cube and capital into that market was frozen. With grid parity, the market suddenly melts and becomes liquid, causing capital to flow quite easily and readily. And energy storage technologies are heading in the same direction, he says, with costs having fallen 90 per cent over the past 20 years and expected to be cut in half again over the next two years. Near the end of his presentation, Gore gives a final jab to politicians who continue to deny and delay when it comes to climate action. How do we eliminate fossil fuel subsidies? How do we put a price on carbon in markets? “The way to do it is to put a price on denial in politics,” he says to much applause. For certified presenters such as Corrina Serda, who are at the gathering to act as mentors to future presenters, there’s no sign of giving up. Quite the opposite, in fact. Not only are the training sessions attracting more people, the mix of participants is getting younger. Serda says she is most impressed that out of the 600 people attending the Toronto training session, about 100 of them – or 17 per cent – are 25 years old or younger. Just this year there have been a few nine year olds trained.